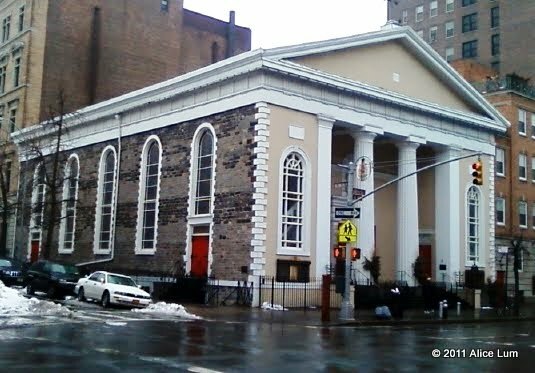 ﻿When John Doran designed the Greek Revival St. Joseph’s Church for the four-year old congregation in 1833 the extensive parish boundaries stretched from Broadway to the Hudson River and from Canal Street north to 20th Street. 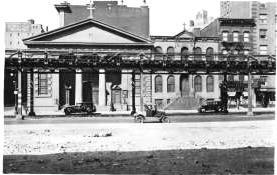 The church was completed a year later and was the largest church in the city after the old St. Patrick’s Cathedral on Mott Street. Doran’s Greek temple design featured two large fluted Doric columns supporting a closed classical pediment above a recessed entranceway. The front façade featured two large arched windows with delicate Federal-style tracery and ornamental ironwork with decorative sunflowers (now sadly gone). Some of the early pastors of the mostly Irish-American congregation went on to prominence. Father John McCloskey, for instance, would become the first American cardinal. Charles Constantine Pise was the first Catholic chaplain of the U.S. Senate. It was, however, Thomas Farrell, who made the most waves. The liberal Farrell, who serviced from 1857 to 1880, aggressively espoused his progressive views. During the Civil War he pushed for political rights for freed blacks and supported emancipation. Upon his death he bequeathed $5,000 to found a new parish for New York blacks, resulting in the establishment of the Church of St. Benedict the Moor in 1883. It was Father Farrel’s involvement with “the Accademia” that caused him problems with Cardinal McCloskey, however. The Accademia was a group of priests who regularly met at St. Joseph’s and openly discussed radical modifications in the Church such as discarding the tradition of priestly celibacy and the Latin liturgy, questioned the infallibility of the Pope and, among other things, wondering aloud how nuns were capable of instructing future wives and mothers. While the exterior of St. Joseph’s remained essentially unchanged, the interior did not. Extensive damage was done in 1855 and in 1885 by fire. The early paneled and gated pews were brought in after the second fire, most likely from a demolished church a few blocks south on 6th Avenue. A fresco above the altar was part of the ornate Victorian décor, subsequently painted over then the interior was toned down in the 20th Century. In 1972 another renovation was done to the interior at which time the 1880s fresco – a copy of Raphael’s Transfiguration in the Vatican -- was rediscovered and restored. A subsequent remodeling in 1991 trashed the charming crystal chandeliers in the galleries, miniature versions of the larger chandeliers still existing over the main aisle. St. Joseph’s is a remarkable example of early Greek Revival religious architecture and has been a moving force in the Greenwich Village community for nearly 200 years. Since 2005 it has been The University Parish of St. Joseph, restructured to serve the Catholic students of New York University, Pace University, New School, and Cooper Union.